I like flan. It tastes good. And this Kozy Shack Flan has everything a good flan should have: perfect flavor and consistency. It melts in your mouth. It’s just right as an after-dinner pick me up. Cool, sweet, and refreshing. It’s also very light. So light that I always feel like I could eat a second one. So I recommend it more for after you’ve eaten a really full and satisfying dinner and you just want that one light, sweet treat for afterwards. This won’t make you explode, by any means. It makes a great summer dessert, or in-between meal snack, since it is so light and cool. You can get this flan pretty much anywhere in your grocer’s refrigerated pudding section. The picture on Kozy Shack’s website looks a lot nicer than mine. It didn’t exactly slide out of the cup for me. I guess practice will make perfect on that, and I’m willing to sacrifice eating a bunch until I get it right. As in all Kozy Shack products, the flan contains natural ingredients: Reduced fat milk, sugar, caramel syrup (sugar, natural flavor, xanthan gum), eggs, contains less than 2% of carrageenan, locust bean gum, salt, natural flavor, annatto extract (color). Next time you need a light, gluten-free dessert, try out Kozy Shack’s flan. You’re welcome. Well, this wasn’t exactly what I was expecting. Sampling the Enjoy Life S’Mores flavor soft baked bar – and I’m not really sure what I think. The presentation is quite nice – see photo. The flavor is good – not quite sure it tastes like a s’more, but I like the way it does taste. I guess what I’m confused about is the consistency. It’s not really holding together as well as it could – it has the potential to crumble when you bite into it. Sort of a sports bar, sort of a cake bar, sort of Rice Krispy bar… Can you see why I’m confused? At 140 calories and 25 grams of carbs, I can personally see other things I would eat in their place. But I will say, that if you like this specific flavor, I haven’t run across anything else like it. All that being said, it is free of the top 8 allergens which include gluten, milk, nut, and soy. Since I can’t have almond or soy as well as gluten, it’s nice to have something else in the wings that I can eat without having to worry about any of those. And it certainly didn’t taste like it was free of all that stuff – it wasn’t lacking in flavor at all. Don’t take my confused word for it – you can try either the SunSeed crunch (baked chewy bar) or the Cherry Cobbler (soft baked bar) for free! Just leave a comment below with which flavor you’d like and we’ll hook you up. U.S. addresses only, please. I ain’t rich. I’m really not sure how I feel about these cookies. The consistency wasn’t quite either crunchy or chewy, which I was okay with. (They are labeled as “Handcrafted CRUNCHY COOKIE” but I do beg to differ on that.) The flavor was very subtle: neither vanilla, nor honey, nor graham cracker. It was more like a subdued sugar cookie, very light on the sugar. They’re not bad, but they could really use a bit more flavor, whether that be vanilla, or cinnamon, or even ginger. I am feeling very unfulfilled right now. These cookies are milk free, nut free, soy free, and of course gluten free. They are also non-GMO verified. Even so, with the price of food today, I’ll be passing on purchasing these. This is one time where I am grateful that I received a sample and didn’t have to pay for a box myself. You can also benefit from the one sample I have of this cookie and find out for yourself if you like it. Just leave a comment below and you’ll be entered to win this sample. Betty Lou’s…. Mmm mmm mmm! So much deliciousness, so little time! At this year’s Gluten-Free Expo in Glendale, Arizona, I was introduced to a new line of candy bars from Betty Lou’s: the Angell bar. They are non-GMO, vegetarian, gluten-free, and organic. So, they probably can’t taste good, can they? OH YES THEY CAN. These candy bars are perfect for me because the only soy is in the lecithin, and two of them don’t contain almonds. I really had to pace myself with these – do you have any idea how hard it was NOT to eat them all at once? Wow, willpower! Well, this was a surprise, indeed. One of the things I miss about being gluten-free is cheesecake. So many recipes have flour in them as a thickener, and if not, they have a glutenous crust. So, when I saw this Dannon Creamery Lemon Cheesecake flavor Dairy Dessert was gluten-free, I grabbed it. Since it contains active yogurt cultures, and – it’s Dannon, I was expecting … well… yogurt: running, tangy, yogurty. When I peeled back the metal cover, it looked like I was right. Kinda yucky looking, isn’t it? But the smell of lemon wafted up to me and it was just lovely. So I gave it a shot. It’s thick and creamy like cheesecake! 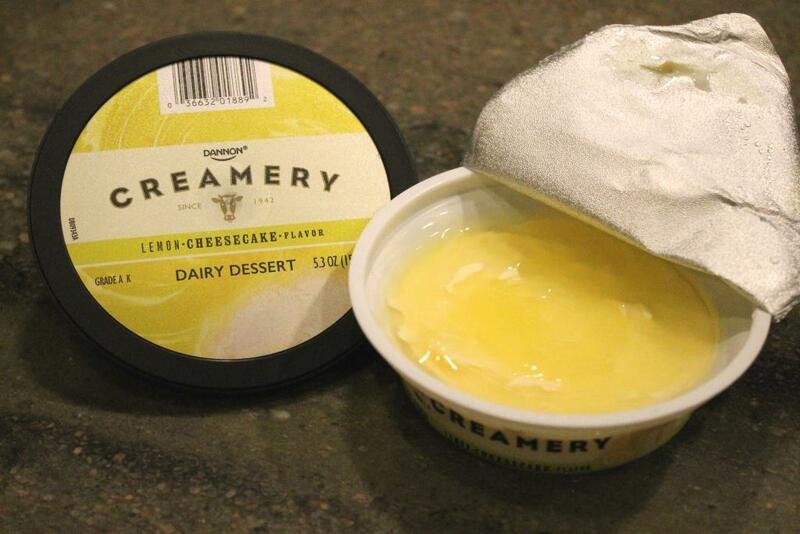 The flavor is very subtle on the cheesecake end – the lemon isn’t that strong, but it does overpower the mild flavor. If you take a bite without the lemon, it’s really delightful. Either way, I’m just happy to be eating something that is like cheesecake, yet healthy at the same time. If you love coconut but hate yogurt, this is the snack for you. That’s right, you can hate yogurt, but that’s okay – because this is not like any yogurt you’ve ever had. This is quite possibly one of my best discoveries so far. For starters, this doesn’t taste like yogurt. It’s smooth and creamy and light – with none of that nasty yogurt tang. There’s lots of real coconut mixed in with it – no need to stir. It’s not a gross fruit on the bottom kind of deal. 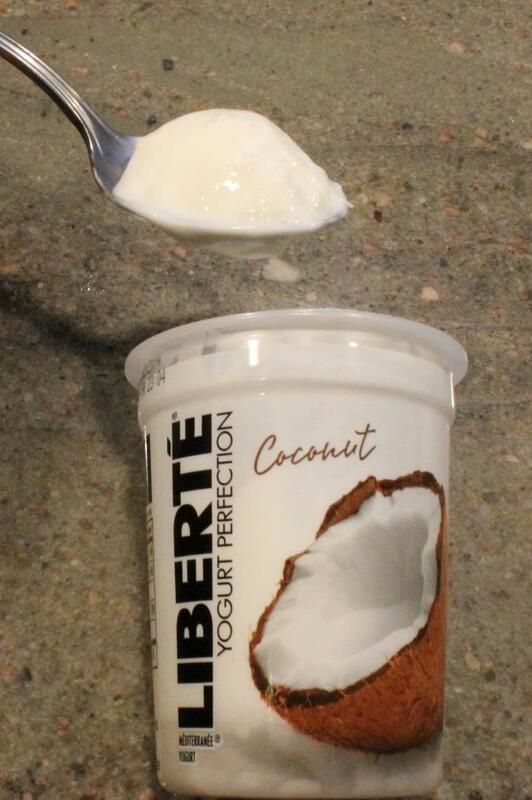 Since it’s not like regular yogurt, and in fact – more like a dessert, Liberte is a bit higher in calories and fat (doy, that’s why it tastes so good!). Still healthy, however: no added color, no artificial flavors, sweeteners, or preservatives, and it contains 8 grams of protein and 5 different strains of live and cultures – it’s totally worth it. I got this single-serving cup at my local Safeway – 50% off for quick sale – and it ended up being like 60 cents. Again, totally worth it.